Reader, you and I are about to share a delicious secret. The disc you’re holding (or perhaps listening to by now) contains a classic of 1970s underground music – a durable classic, in fact, from an era whose most spectacular productions often proved ephemeral. It is a musical monument, vast in scale, rich in polyphony, resonant in cultural associations. And yet, unbelievably, few people have heard of it. It is one of those wonderful artistic productions that somehow slipped through the cracks, a disaster that our cultural cognoscenti assure us never happens. I indulge a slight measure of hyperbole: there is a circle of New York musicians who realize that Petr Kotik is a major, profound, brilliantly inventive, and intensely original composer, even if he remains unknown to the general public. If one wants reasons, there are plenty to choose from. 1) He is an expatriate with the usual disadvantages of that position, considered European in America and American in Europe, thus easily ignorable on both sides. 2) He has devoted himself to conducting and producing other people’s music, so that the people who know his music are mostly composers who want him to do something for them, rather than the other way around. 3) His musical aesthetic followed a trajectory set in the 1970s, while the music of the 1980s veered off on a very different (and less adventurous) tangent, leaving him unstylish. 4) His music (this is such a common one) is so vastly original that very few people “get it.” Need more? And so Petr Kotik remains one of the great unknowns of music at the turn of the 20th-Century, an intrepid and intransient pioneer who has persevered for 30 years with little recognition. Born in Czechoslovakia, he became enamored of the music of John Cage, with whom he first performed at the age of 22 – Kotik is a virtuoso flutist. In 1969, at the invitation of Lejaren Hiller and Lukas Foss, he came to Buffalo, New York, for a residency at the Center for Creative and Performing Art at the State University of New York at Buffalo. Meanwhile, however, the Soviet occupation of Prague made it inadvisable for him to return home. Stranded in a country whose aesthetics he admired but whose politics and economics he has always found depressingly incomprehensible, Kotik formed his own ensemble to play his music, the S.E.M. Ensemble (whose initials stand for nothing except perhaps the middle letters of “ensemble”). She had this thing. She had loving children. She had one. He did not live to be going on being living. She was not expecting that thing, she was not expecting him to be one not going on being living. She was one not succeeding in living. She was a sad enough one. Like Stein’s friend Virgil Thomson, Kotik writes a flat, uninflected kind of vocal line perfectly suited to Stein’s generously repetitive prosody. I once wrote that hardly any younger composers had followed in the footsteps of John Cage, and a friend (Richard Kostelanetz, in fact) pointed to Kotik as an exception. It’s obviously true in an important way, yet when you think about it, it’s hardly true at all. Nothing in Many Many Women (nor in any of his other music) sounds in any way like Cage’s randomized pointillism, even less like the rhythmic modalism of his early works. Yet there is a Cagean counterpoint running throughout the work, a continual overlap of lines that go together without having been specifically planned to. Even more centrally, Kotik’s music is non-hierarchical in the same way as Cage’s: there are no climaxes, no parts more significant than any other, no bridges, no transitions. If you could make Cage’s music lyrical, or perhaps interest a bunch of Gregorian-chant-singing monks in Cage’s chance processes, you might come up with a result something like Kotik’s music. For the melodic and harmonic aspect of Kotik’s music are far removed from Cage’s sound world. There are 173 segments of music in Many Many Women, ranging from quite long to very short. Each of them is a line sung (by voices) or played (by instruments) in parallel fifths, fourths or octaves. Such a doubling has not been heard to this extent since the days of Notre Dame organum in 12th-Century Paris. And the melodic lines are so steady, so reassuring, yet so unpredictable. They’ll drone along on one pitch for several syllables, moving to an inflecting neighbor note, then suddenly leap to another register and wander back. No one else’s music sounds like this. How did Kotik derive it? The answers are idiosyncratic, and show what a refreshingly practical, nontheoretical, intuitive composer Kotik is. The lines in many of his early works are drawn from a bunch of graphs he found in the early 1970s; the graphs belonged to a science professor friend who was throwing them away, and charted response times to alcohol in experiments with rats. Kotik was charmed by the shapes and used them for years, so that the chantlike lines constitute a kind of “found melody.” Practicing the melodies written from these graphs with singer Julius Eastman (an S.E.M. regular who later untimely died at 49), he found them difficult to keep in tune, so he practiced with Eastman by doubling the melodies at the octave. To his surprise, he liked the sound. If octaves sound so good, Kotik thought, then perhaps all the perfect intervals will. He started to use them all, octaves, fifths, and fourths. Movement in parallel intervals became a feature of Kotik’s music that instantly identifies it as his. The doublings give the melodies a sturdiness, a harmonic emphasis which create a curiously tonal effect even in the most random counterpoint. And so, in his works of the 1970s – most monumentally Many Many Women and Explorations in the Geometry of Thinking (1979-82), on a text by Buckminster Fuller – Kotik created a music that floated in “tonally atonal” chanted lines, like so many joyously random Benedictine monks seduced to a postmodern liturgy. The aesthetic was of the 1970s, expressing spontaneity and rebellion against hierarchical authority, yet Kotik had captured those qualities in stately, introverted melodies that seemed etched in granite. No one quite knew what to make of this music, just as few know today. It did gain admirers among New York new-music lovers who would flock to Kotik’s concerts in the knowledge that they were hearing something very spiritual and pure and special. Eventually, in such works as Wilsie Bridge (1986-87) and Solos and Incidental Harmonies (1983-85), Kotik quit using the graphs – having internalized them into a distinctly personal melodic style – and began adding to his music a vibrant percussion track of tambourines, cowbells, and ride cymbals. His music of the 1990s (for instance Quiescent Form of 1995) is marvelously sculpted, elegantly contoured, too seldom heard and far too seldom acknowledged. Many Many Women stands at the beginning of his career as his early masterpiece, a classic on its own terms and a promise of great things to come. Whatever the "place" of "Many Many Women," Miss Toklas says that Gertrude Stein thoroughly enjoyed herself writing it, and it shows.--Donald Sutherland, Gertrude Stein (1951). This neglect is odder still when you consider that certain composers have done some of their best work with Stein texts. In the second edition of my Dictionary of the Avant-Gardes (2000), I suggested that the very best Virgil Thomson pieces were done to Stein texts - not only the familiar Four Saints in Three Acts (1934), which is the only Thomson opera to be regularly revived, but Capital Capitals (1927), a lesser-known but no less spectacular song for four male voices. Instead of shrieking to dissonance, as too often happens in contemporary song, the singer(s) here perform in other, more attractive ways. Something comparable happened to Petr Kotik when he discovered Stein in 1971. However, where Thomson was a Harvard boy who had learned about Stein, then scarcely known, from his teacher S. Foster Damon (who, decades later, was my teacher as well), Kotik discovered Stein as a recent immigrant who barely knew English. What attracted him was American language that was original and yet accessible. Whereas Thomson enjoyed Stein's wit and her freedom from semantic requirements ("pigeons in the glass, alas"), Kotik make Stein into something else - an innovative, exhaustive kind of contemporary plain chant with open chords. A further departure was Kotik's decision to use the entire Stein text, pushing his piece to the audacious and finally marvelous length of almost six hours. From its magisterial opening of "Any one is one having been that one," Kotik's Stein is continually austere and yet engaging, realizing a musical reinterpretation of Stein's text, much as Stein productions at the Judson Memorial Church in the 1960s reinterpreted the theatricality of other Stein texts. Some decades later, I think the use of Gertrude Stein pushed Kotik to esthetic heights much as her words raised Thomson. One sign of its radical effect upon Kotik's own compositional practice is that he has since set other texts likewise classified as prose, beginning with Buckminster Fuller's Synergetics. 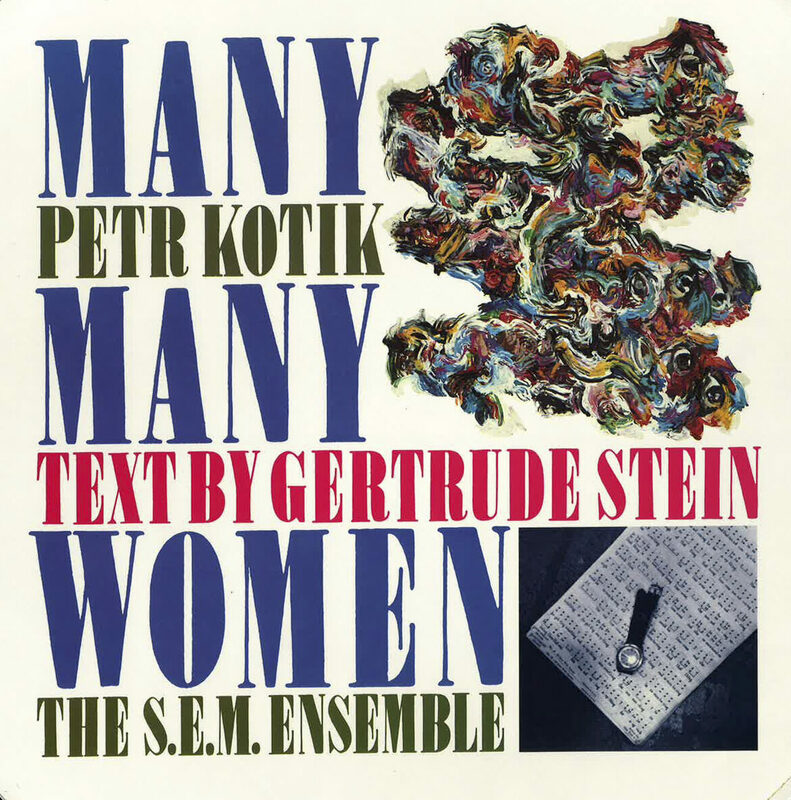 I should confess that when approached about writing linear notes to this album decades ago, I declined, to my eternal regret, because Kotik's Many Many Women is, like Stein's text of the same name, a masterpiece that I've appreciated many times since. This performance of Many Many Women begins with two bass voices singing ­– almost chanting, really – the beginning of the Gertrude Stein text in open parallel fifths, sounding, except for the chromatic movement of the melody, as if they were singing 12th century organum. Further in on the first side, after some intricate, dissonant interplay of flutes, clarinets, trombones, sopranos, tenors, and basses (which throughout the piece create a peaceful, organ-like sonority) there’s a wonderful brief flash of brighter sound, a sudden consonant chord that fades back quickly into the chromatic background. Still later on the same side, the flutes soar above the range they’d been in, making, as they move, throbbing, plangent, bitingly tart harmony with the other parts. On side two there’s a static passage for trombones and clarinets, which together hold a dissonant chord; pause; renew the chord with a simultaneous attack; move away from the chord; move back; are joined by the flutes; and finally are joined by the two bass voices, which begin exactly two octaves lower than the last flute notes, as if they wanted to move the rugged, unchanging sound into some kind of tonic key. On side three the music pauses for a long time on a peaceful added sixth chord, right out of Debussy or Burt Bacharach. Every repeated chord in this piece, every pause, every narrowing of the texture to a single pair of voices creates enormous suspense, because there’s no way to predict how or when the normal progress of the music will resume. The separate parts that make up the piece are carefully composed, but nothing about the way they go together is planned; it all happens by chance. This makes simultaneous attacks on a repeated chord something of a miracle; but then the point of Petr Kotik’s way of composing this piece is to create a performance process in which miraculous musical things will happen. On side eight, the two tenors somehow harmonize with two other voices to create a passionate, tonal melody against a background of dissonant turbulence; on side ten there’s a cadence straight out of a medieval motet. These may be my favorite moments; Kotik, who hears his music with as much sense of discovery as anyone else, surely has favorite moments of his own. Many Many Women is in the Cageian tradition of music that takes shape in composition and performance to some extent free from the obsessive control of its composer’s personal taste. It’s unusual, though, among works of this kind because it has the linear, contrapuntal texture of much Western classical music. And it even creates an illusion of traditional Western harmony, both consonant and dissonant: the familiar texture leads a listener to expect familiar harmonic sounds and these actually occur, but of course at random, unsettlingly (though refreshingly) unstructured by any actual harmonic direction. The sound of Many Many Women has been compared to the fourteenth century composer Guillaume de Machaut (it’s most like Machaut’s Note Dame Mass) and to Stravinsky (perhaps it’s closest to his Mass and to Cantinum Sacrum); the comparison is apt but the combination of Machaut, Stravinsky, and Cage is surely unprecedented. Many Many Women isn’t music you listen to so much as music you live with. It’s not necessary to hear these five records straight though, but it’s well worthwhile to spend a lot of time with them; you may find intriguing and arresting music anywhere, or everywhere.